"Remittances;" "Transparency;" "Policies and Regulation;" "Fostering Innovation;" "Financial Inclusion;" "Literacy;" "Culture;" "Transaction Costs." 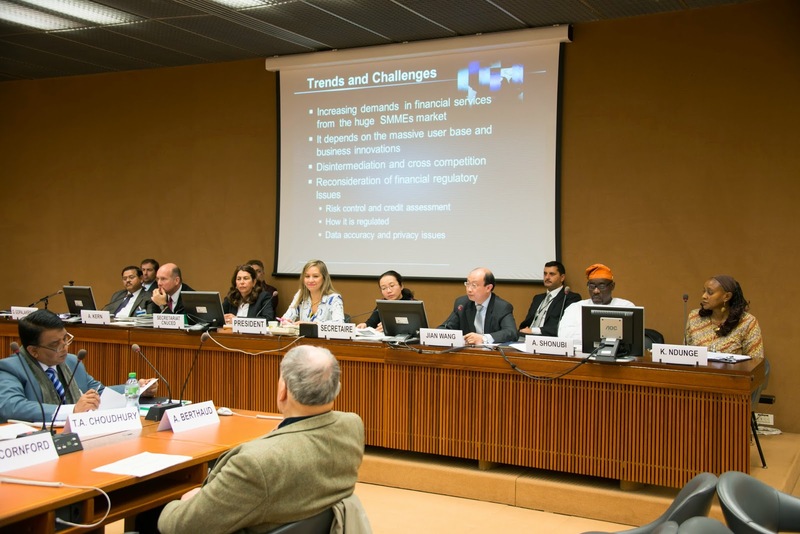 These were selected words I heard repeatedly at the forum - "Expert Meeting on the Impact of Access to Financial Services," organized by UNCTAD and held in Geneva, Switzerland in November 2014. I was grateful for the opportunity to represent IMTFI and its research network in the session - "Highlighting Remittances on Development: Economic Empowerment of Women and Youth," and to be present during this very important conversation at the United Nations. The conference was highly anticipated with very bold objectives. Upon arrival at the meeting room, I was thrilled to realize that, in addition to participants from predominantly international organizations and academic institutions, there were over 45 representatives from member States of UNCTAD, most of them from the Global South. This group of representatives and experts brought a voice and insights that enriched the conference, especially since the meeting began on the premise that with strong policies, regulations, and programmatic initiatives to address the factors—cultural, economic, regulatory, physical, and social—which often hinder financial inclusion, we could build a stronger framework for poverty reduction. These representatives will be the ones to ensure that the outcomes of the conference are integrated into national strategies and plans. Beyond the sessions, I spent quite a bit of time discussing and debating the issues raised with numerous representatives from Malawi, Tanzania, Kenya, Cote d’Ivoire and many others. The general agreement seemed to be that we all have to do better to strengthen financial inclusion, especially for those people that our societies have marginalized. The populations that frequently came up in the discussions as the most vulnerable to, and affected by these factors, were youth, women, ‘the poor,’ rural areas, and individuals with disabilities. Two sessions were held on each of the three days of the meeting. IMTFI had compiled a handout outlining all the research studies over the years that have linked women and financial inclusion, “Snapshots of Gender and Financial Inclusion,” which I shared with the other attendees. This was extremely helpful to participants because it provided information about the practical ways that IMTFI researchers are contributing to discussions around some of the challenges that we were going to focus on at the meeting. Day 1: How do we actually define and articulate financial inclusion in our programs and policies? Why? The first session, “Trends in financial services and financial inclusion,” used case studies from various countries including India, China, and Kenya. A key emphasis was on the barriers to financial inclusion and how we address these to ensure that populations, especially marginalized groups in society, are empowered. This was the forum where I presented the IMTFI funded research, “The Use of Mobile Money Services and Platforms among Vulnerable Populations in Kenya.” In this study, Jane Mutinda and I show how persons with visual impairment, both in Kenya and globally, are often discriminated against when it comes to financial services and products, especially in relation to mobile money technology. Following the session, I was a bit shocked by the number of people that commented they had not considered the integration of persons with visual impairment into their initiatives, in their particular countries. This not only confirmed our research findings but it was a recognition of how much work we still have ahead of us in addressing "financial inclusion" in a comprehensive way—ensuring everyone’s well-being is central to our policies and practices. The second session put policy and regulation issues more in context. With perspectives from the Philippines, Mexico, India, Bangladesh, and global institutions like the World Bank weighing in, the debate was around enabling policy environments to facilitate financial inclusion. There was extensive conversation around governance at many levels—examining the role of public sector (governments), civil society, and private sector. One of the best models of a national strategy for financial inclusion strategy was a case study from the Philippines. It covered a whole range of aspects from defining who’s excluded to how initiatives like microfinance, technological innovations, and e-money can help these populations become part of the benefits of financial services and growth. This session started the ongoing discussion about financial literacy education which continued on the second day. For me, it continued to stir my curiosity and questions about financial inclusion: What do we really mean when we use the term ‘financial inclusion,’ especially since contexts vary globally? How do we develop and implement effective models of financial literacy programs to ensure inclusion? Is there sufficient commitment to put resources into these types of educational initiatives? Read Ndunge's UNCTAD reports here: Defining Empowerment and Vinya wa Aka.